IT IS a tale of survival that has left one cat owner very happy and a Gympie man dubbed a hero. 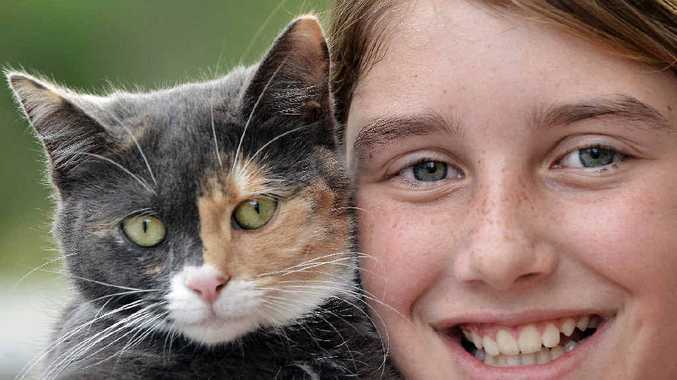 Glenwood's 11-year-old Alicia Tozzetti did not think she would get to see her personable cat Sox again after her pet spent five days in a tree about three storeys high. The five month old feline climbed a pine tree on the family's property last Tuesday. On hearing the distressed meow, the owners tried to coax her down, but the scared pet climbed higher every time they got close. The worried family tried calling, rattling food and reaching with a ladder, waving a pool cleaner attached to a crutch, but the reluctant kitten had to spend the cold night in the tree. Alicia, her mother Nicole, father Luke and teenage brother Connor each spent hours beside the tree. The family was getting desperate by Thursday, so Mrs Tozzetti contacted the rural fire brigade, the Gympie fire brigade and the RSPCA. Due to the location, or service provision, nobody could help. In complete frustration, Mrs Tozzetti sent out a plea for help on a public Facebook page. Out of the 238 suggestions over many days, which included hosing the kitten out of the tree, teaching it to climb backwards and putting the family's other cat up the tree to get it down, some hope emerged. On Sunday morning at 8am, David Garard, a climbing arborist by trade, arrived at the home, hooked a "life-line" in the tree and climbed up to the tired feline. Mr Garard said just as he got within a few metres of the kitten, it jumped down to him. A cat owner himself and experienced at handling wildlife in his profession, he was the perfect man for the job. He said the cat was "as happy as Larry" as he handed it to Alicia. Mrs Tozzetti said a lot happens in life that makes you lose faith in humans but to have someone give up their own time for free with such care was priceless. "Honestly, he's a legend in our eyes and my daughter thinks he's a hero."